The moment the topic of Tampa Bay Beer Week comes up, everyone wants to know what events I am going to, which ones are “can’t miss”, and so on. At the time of this writing, there are somewhere in the neighborhood of 250 different events between March 2nd and March 10th. I am only one man, however, so I can’t go to every single one I want, but here are some of the ones I think are the most interesting. This yearly event is a great way to start off the week. Nearly every brewery in Florida is represented, their brewers are here, and attendees get an opportunity to celebrate the amazing strides craft beer has made in a short amount of time. Last year the kick off to Tampa Bay Beer Week was highlighted by Tampa Mayor Bob Buckhorn tapping the first firkin in the patio of Tampa Bay Brewing Company. It was a great photo op, and gave some legitimacy to our movement. This year, things are being taken up a level. Thirteen breweries have contributed to this firkin. Yes, you read that right, thirteen of the fourteen breweries in Tampa Bay added to the batch that will be tapped and served at 3:00 pm on Saturday. The beers were combined and casked at Barley Mow, and word is the result – an IPA hybrid – should be very interesting. Once again Mayor Buckhorn will be tapping the cask and sharing in this once-in-a-lifetime beer. Honestly, I have never heard of any festival doing something like this, so it should be a historic moment. At this point, there are probably not any tickets available, but this is one of my favorite events. Every beer here is a Gold Medal winner in the Best Florida Beer Championship. This truly is the best of the best in Florida. Your ticket gets you unlimited access to the 50+ brews from around the state, plus food and great music all day long. There is also a homebrew competition from around the state. There are numerous “tap takeovers” and “drink local” events tonight on both sides of the bay. One special event though, will be a craft beer retailer extraordinaire Lueken’s Liquors in Dunedin. They are doing a special cellar release of Dogfish Head 120, Bells Hopslam, Sam Adams Utopias, and 2011 and 2012 Cigar City Marshal Zhukov. Obviously there is very limited supplies of these, so you will want to get there early. Plus, Cigar City brewmaster Wayne Wambles will be on hand for a meet and greet. More Lueken’s goodness! Today will mark the first-ever bottle release from both Barley Mow Brewing Company and Rapp Brewing! Very limited supply, but a must for the true craft beer connoisseur. Event begins at noon. Last year, one of my favorite events of Beer Week was the dinner at Tampa Bay Brewing Company. This year the dinner will feature 5 TBBC beers, 1 Southern Brewing and Winemaking (SBW) Beer, 1 Ciser by SBW, and a single malt scotch toast at the conclusion. The beers will be paired with TBBCs Chef John’s creations to compliment the beers, including overnighted Hawaiian swordfish, Muscovy duck, and other amazing dishes. I can tell you, this event will blow you away. This is one of those days I wish I could be in 3 or 4 different places at once. So much great stuff happening! At 6pm Dunedin Brewery is having a special vertical tasting of 5 years of Sierra Nevada Bigfoot Barleywine (one of my favorites). At 6:30, Barley Mow Brewing is having a “Fun with Beer” event replete with beer cocktails, style tastings, and so on. At 7pm, Dunedin Brewery, Cigar City, & 7venth Sun join forces with the Dunedin Smokehouse for a beer dinner and a preview of the Subtropical Farmhouse Ale collaboration. At 7:30pm, Mr Dunderbak’s is having a sour beer ice cream social! WHAT?! Pairing many sour beers from all around the world with crepes and ice cream, sour beer reductions, as ice cream toppings, and other madness! How is one mortal to choose?! The too-often-overlooked Lagerhaus in Saftey Harbor is having a wonderful Hefeweizen festival! A wide variety of authentic German Hefeweizens will be introduced, like traditional Weisse, Smoked Hefeweizen, Dunkelweizen, Honey Weizenbock, Tangerine Hefeweizen and Hefeweizensturm ( fresh Hefeweizen). There will be free sampling, and a great array of food for purchase. Starts at 5pm. Later that evening, a very special event is going on at Saint Somewhere in Tarpon Springs. Come meet the brewer/owner of Belgium’s Brouwerij The Musketeers, brewers of the Troubadour line of beers along with a Saint Somewhere tour and tasting. Be there by 7pm. If you can start early, be at Peg’s Cantina at noon for a special barrel tasting of Cycle Brewing beers. This was an amazing event last year, and a must for anyone who loves the barrel! At 5pm, head on over to Rapp Brewing for the Sausage Party! Greg will pair some of his amazing brews with locally made sausages, and you can enjoy the Rapp Brewing tasting room. Over at Barley Mow (and joined by Florida Beer Company), it is the second annual Firkin’s and Food Trucks event, featuring some of the best food trucks Tampa Bay has to offer, and firkins from around the state. If you are on the other side of the bay, swing by Southern Brewing & Winemaking for the Best Florida Beer Championship Leftover Party. This one is a steal at $10, and features some of the best homebrews the state has to offer, food trucks, and presentations from beer judges, homebrewers, and more. In addition, there will be tones of local brews on tap for purchase, including 7venth Sun, Cigar City, Tampa Bay Beer Company, and St. Somewhere, as well as Southern Brewery’s amazing beers brewed onsite. 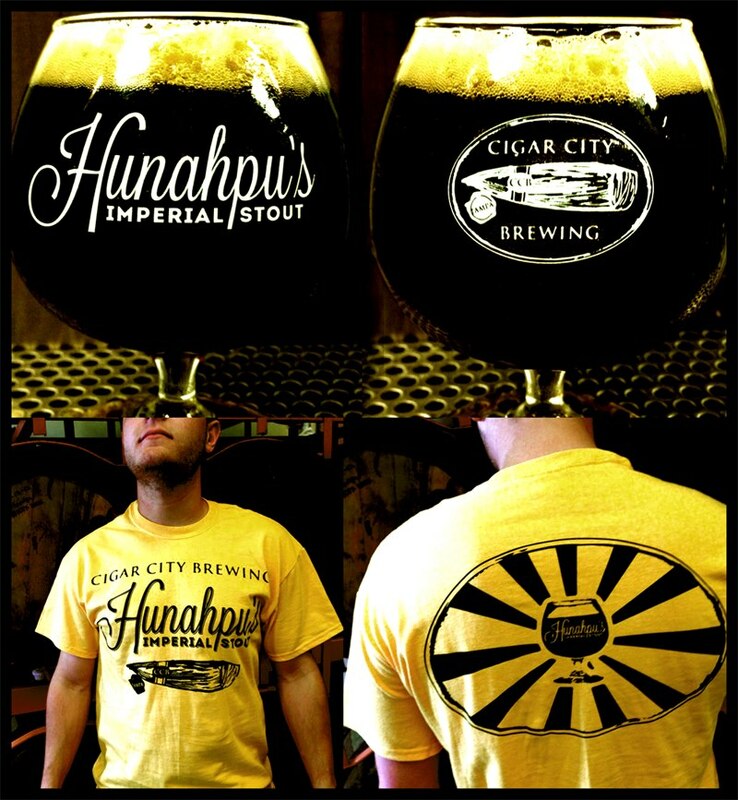 It’s Hunahpu Day. ‘Nuff said. However, there ARE other events, should you be so inclined. The 97X Beer in the Park festival is going on in Hyde Park, numerous tap takeovers across the Bay, and a cool “Mystery Beer Night at Crum’s in St. Pete with the Florida Beer Company. Alas, all good things must come to an end. Go out in style with the Hunahpu’s Hangover Day at 7venth Sun Brewing and enjoy the new recipe release of the doughnut porter (a brand new imperial porter version of this beer). Several previously unreleased barrel aged beers on tap, almond-aged Super Fly on tap, and a breakfast themed food truck on site. Finally, bring your epic week to a rousing close at the Ale & the Witch in St. Pete at the Grande Finale. From 4pm – 8pm, all 32 American craft brews on tap are $4 each, and enjoy live music by the amazing Applebutter Express. A lot to take in? You bet. But that is what it is all about. Celebrating great beer in Tampa Bay. For the full list of events visit the official website at www.tampabaybeerweek.com. If you see me during the week, come up and say hello! I’d love to toast with any and all craft beer lovers! ~ by Sean Nordquist on February 27, 2013.